Product Review: Leaf Genesis	Overall rating:	0	out of 5 based on 0	reviews. And on the Friday the lord declared “let there be awesome,” and thus Leaf Genesis was born. The latest creation from Leaf dropped on Friday and it looks pretty awesome. Spanning the full history of hockey Leaf Genesis brings together the young stars of tomorrow with the legends of yesterday. Collectors will be pleased to see 8 hits per box, a step up from some of the products of late. The young stars portion of Genesis kicks of the product in a big way. You can expect that 6-7 of the hits in each box will be young star related, with the rest being legends. This means that collectors have the opportunity to snag autographs of some of the best up and coming names that the sport can offer. 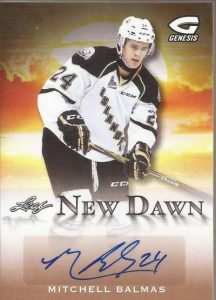 The New Dawn autographs set boasts names such as Jack Eichel, Jesse Puljujärvi , and Matthew Tkachuk. With multiple short printed colour variations, this set offers the opportunity to snag big autos early. Collectors can expect an average of 3 of these cards per box. For those who like their autographs with a taste of memorabilia, the auto jersey and auto patch sets are sure to please. These sets have identical checklists, but with different print runs. Additionally, the patch version only includes the black printing plate insert, rather than the traditional 4. Once again Jack Eichel is the big name to watch for, but players like Sam Steel and Nolan Patrick also make an appearance. Expect the cards to fall at 1 per box or less. 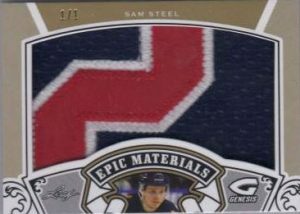 On the purely relic related side of the young star section are the Epic Materials/Patches sets. These large piece mem cards feature only the best that the CHL has to offer and are a glimpse into hockey’s future. 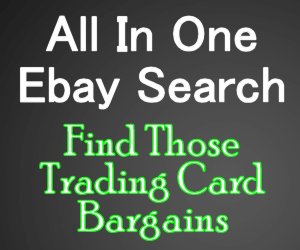 This is a large checklist with 71 basic cards available for each set. Once again several colour variations are available, and the patch printing plate comes only in black. These cards are very similar to those that appeared in this year’s Heroes and Prospects product. Expect an average of 4-5 of these per box. Now we move onto what I have to consider as the meat of the product, legends. This is where Leaf (and previously ITG) shines. Leaf seems willing and able to get their hands on legend autos and vintage memorabilia, something that Upper Deck has failed to do. Even though legends hit usually fall at only 1-2 per box, we the legends collectors of the hobby, salute Leaf for their efforts. 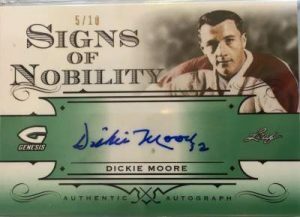 The first set of legends autos that Leaf Genesis has us looking at is the Signs of Nobility set. This 23 card checklist doesn’t have a single disappointing name on it. Collectors can expect to chase names such as Dickie Moore, Gordie Howe, and Vladislav Tretiak. With the usual sets of coloured parallels being included, this set looks to be pure gold. The second set of legends autos is the Classics Duos set. These cards have not 1, but 2 legendary players on each card. With combinations such as Hodge & Buyck, Bure & Linden. 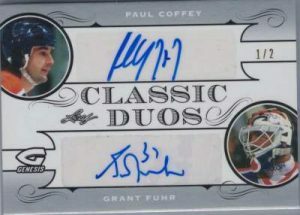 And Fuhr & Coffey, collectors are sure to climb the walls to get at these. As amazing as the autographs may be, Leaf Genesis kills it with their legends memorabilia sets. Each card in these spectacular sets includes up to 8 players, each with their own piece of game-used memorabilia. Fans are going to be salivating over these ones. Single player legends relics come in two sets. The first, Hockey Lore, features relics from some of the biggest names in hockey history. Bobby Orr, Gordie Howe, Maurice Richard, and Wayne Gretzky are only some of the names on this illustrious list. With the majority of the base set being #/5 (Lemieux & Gretzky are #/10) this is a mega pull for any collector, especially considering that silver (#/3) and gold (1/1) are the only parallels, aside from the plates. 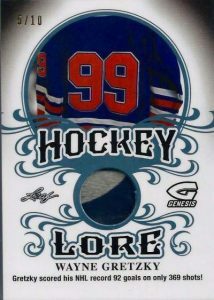 The second single player legends relic set s the aptly named Origins of Hockey set. Spanning the entire history of the sport this 20 card set is #/5 or less, with silver (#/3 or less), and gold (1/1) parallels (plus plates). Maurice Richard, Bill Barilko, Newsy Lalonde, and King Clancy are just some of the names on this star studded list. Dual player relics have 2 checklists in Leaf Genesis, Record Breakers and Classic Rivals, both of which feature 2 legendary players on one card. 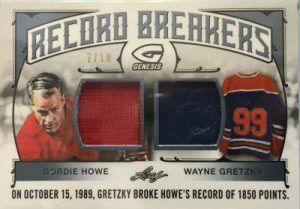 The Record Breakers set consists of an NHL record holder, as well as the player whose record he broke. This leads to combinations such as Howe & Gretzky, Sawchuk & Brodeur, or Maurice Richard & Darryl Sittler. Such combinations are guaranteed to be big sellers. 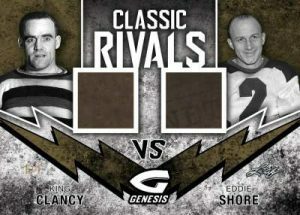 Classic Rivals is, as the name suggests, a pairing of two classic players who were fierce rivals. #/4 this 4 card set has 5 colour parallels, plus the plates. 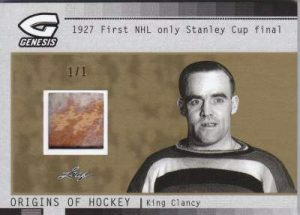 Rivalries include Howe/Richard, and King Clancy/Eddie Shore. With names such as these it’s hard to get a miss on these. 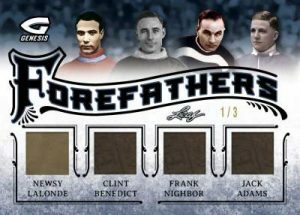 The Fore Fathers set features mem from 4 of the NHLs’ earliest players. Names included in the combinations include Aurѐle Joliat, Hap Day, Nesy Lalonde, and Howie Morenz. I can’t even begin to fathom how much some of these cards are going to be worth. An amazing set to say the least. The final set that we’ll take a look at is the Franchise Legacy cards. These seem to fall 2-3 per case and feature mem from 8 different legends of 1 team. With 19 cards in the set this presents plenty of opportunity amazing hits. 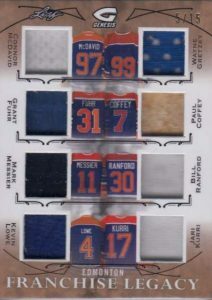 This set isn’t 100% exclusive to retired players however, names such as McDavid, Crosby, Iginla, and Lundqvist all crop up. As a Habs fan my personal favorite has to be FL-18, which features Maurice Richard, Doug Harvey, Jean Beliveau, Bernie Geoffrion, Aurѐle Joliat, Steve Shutt, Patrick Roy, and Larry Robinson. This is truly the Holy Grail for collectors. I feel as though it is safe to say that Leaf Genesis makes a lot of promises. Unfortunately without the NHL licensing (screw you Bettman) team logos won’t be appearing. This had lead to some odd looking cards and a lower than expected resale value. But at a price in the $135usd range per 8 card box, I’d say that the risk is justified. Without an associated list of teams box breakers will have to stick to hit drafts, but none the less. This looks to be an awesome product.